The music in this collection has probably been more studied, performed and recorded than any other guitar compositions of the twentieth century. This collection gathers Villa-Lobos' most famous works in their original forms and complete with Andres Segovia's original introduction to the Twelve Etudes. Includes: Choros No. 1 • Suite Populaire Bresilienne • Douze Etudes • Cinq Preludes. 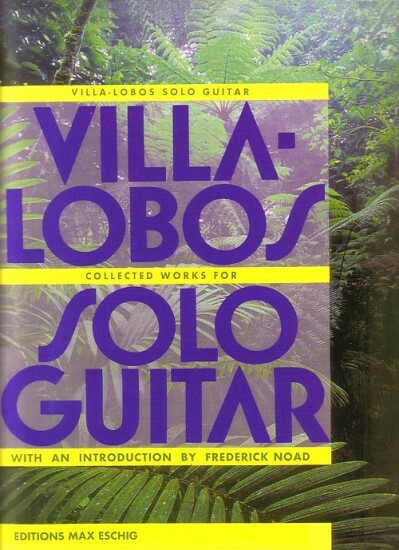 The Villa-Lobos Complete Music for Solo Guitar CD is also available. Came faster than I thought and was in pristine condition! Fair prices and they always leave a nice message for you! Good place to support the music business! Good book, a little hard to read notes in the printed style. You have to concentrate because notes a little fuzzy in first section the preludes are easier. Everything I have ever ordered from this company has arrived quickly and is always packaged well. I highly recommend using their service.